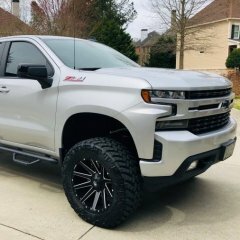 Has anyone put black trim on their 2019 1/2 ton Serria denali? I am not a fan of the Crome on the truck except for the grill. Stupid question, but is this a product or a service? That's why I just got the AT4 instead, mostly the same but -chrome and a bit of color in the interior to boot. All the other bells and whistles except for the mag ride. Only chrome is the tail pipes and badges. Almost got the satin steel denali as I kept missing it in an AT4 as its a sweet color and hard to get here. But Dark sky was my second choice and I got one with the performance pack so bonus. Your best and cheapest option would be the vinyl like noted above.